Sangamwadi hosts #WowVenue Verified Venues, ranging in capacity from , and priced between . There are Banquet Halls in Sangamwadi. Sangamwadi features Small Banquet Halls and Large Banquet Halls that are ideal Venues for Private Parties, and AC Banquet Halls and Hotel Banquets that are perfect Venues for Weddings. Top Banquet Halls in are . Banquet Halls in Sangamwadi have a capacity range of , and a varied price range from , depending upon the location and type of Venue. Sangamwadi harbours some of the Best Luxury Banquet Halls too, such as . Sangamwadi features Popular 5 Star Hotels like . These Venues offer Lawns + Banquet Halls, ranging in capacity from , and priced between . WOW Venue’s Recommended 5 Star Hotels in Sangamwadi like allow Indoor & Outdoor Catering, Cocktails & Hard Liquor, and Outdoor Music too. These are excellent for any kind of event - be it Weddings, Conferences, Receptions, or Birthday Parties. Resto-bars and Lounges are perfect Venues for Outdoor Parties and Cocktail Parties. Sangamwadi houses some of the Top Lounges and Rooftop Venues like , ranging in capacity from , costing between INR . From Budget-friendly #WowVenues in Sangamwadi to Premium Luxury #WowVenues in Sangamwadi, avail up to 30% off on the venue of your choice at WOW Venue! BOOK NOW! Conrad Pune in Sangamvadi is the Hilton company's first luxury hotel in India. An iconic structure in the heart of Pune's dynamic central business district. 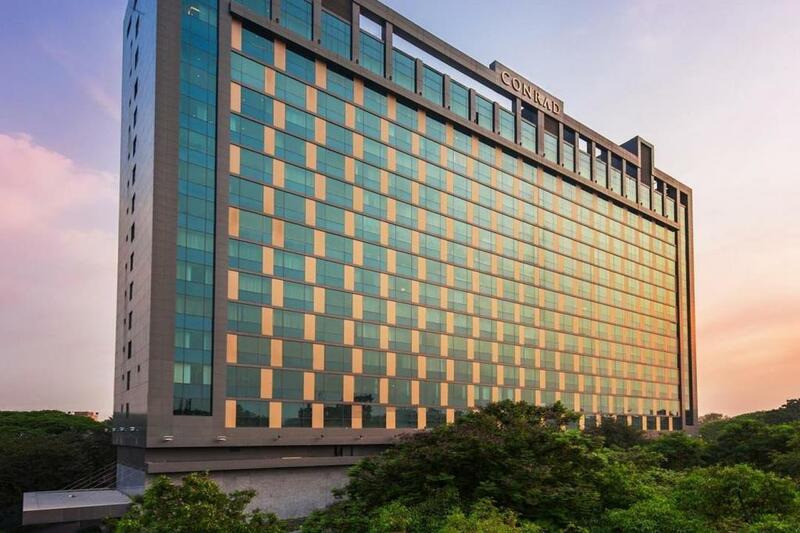 As one of the event venues in Sangamvadi, the striking Conrad Pune is among the 5 Star wedding venues in Sangamvadi for hosting an amazing wedding event and related functions. This destination wedding venue in Sangamvadi presents with a great space and beautiful interior space which is a perfect location to host all wedding rituals, amidst the wedding venues in Sangamvadi. Providing the backdrop are expansive public spaces with impressive, 40-feet high ceilings, bold geometric shapes, striking dashes of color and hints of lavish ornamentation at this luxury wedding venue in Sangamvadi. A visually stunning structure with its foundation in the Art Deco-style, Conrad Pune provides the perfect setting for the wedding of the dreams. In Conrad Pune find banquet halls in Sangamvadi with capacity for each budget and taste: for 80, 90, 200, 260 or 880 people. Most of all the hotel's team proud of its ballroom, which can be divided into sections to make it suitable for different types of receptions. Well-equipped to offer with an amazing set of services, book this banquet hall in Sangamvadi appealing to all wedding details, as well as to host all corporate events in Sangamvadi , providing an accommodation space for 1200 people. Conrad Hotels & Resorts in Pune provides with all modern amenities and comforts, making all wedding day a memorable event.